I faced a rare conundrum the other day: an unopened pack of Boursin cheese that had been sitting pretty in my fridge for several days. In case you’ve been living under a rock, Boursin is this ridiculously delicious brand of creamy, flavor-packed French cheese that goes well with pretty much anything – eggs, crackers, you name it. It’s like goat cheese on crack. 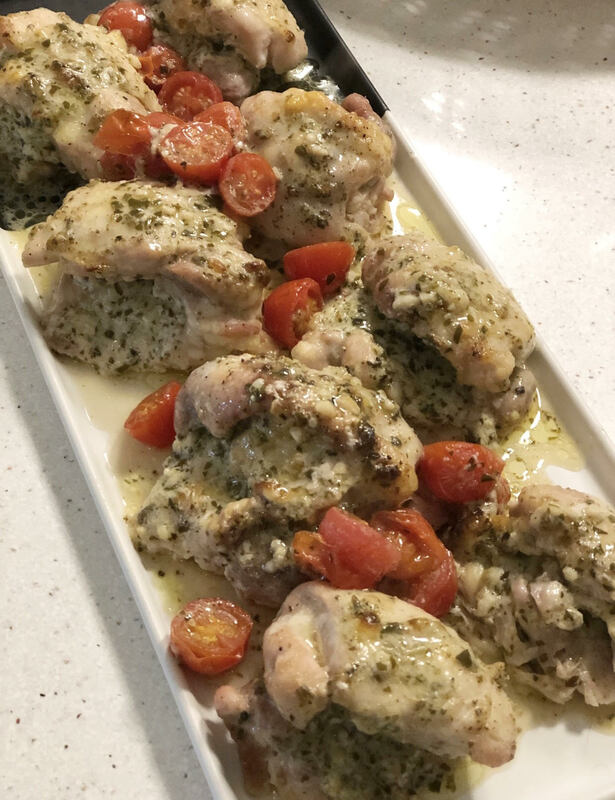 While brainstorming recipe ideas for using Boursin in a quick weeknight chicken dinner, I came across this Rachael Ray recipe that looked fabulous, but a bit too time-consuming. **the Rachael Ray recipe calls for a full pack, but IMHO half a pack is all you need since the cheese is so rich and flavorful! Preheat oven to 450 degrees Fahrenheit. In a medium-sized bowl, mix together the cheese and pesto until nice and creamy. 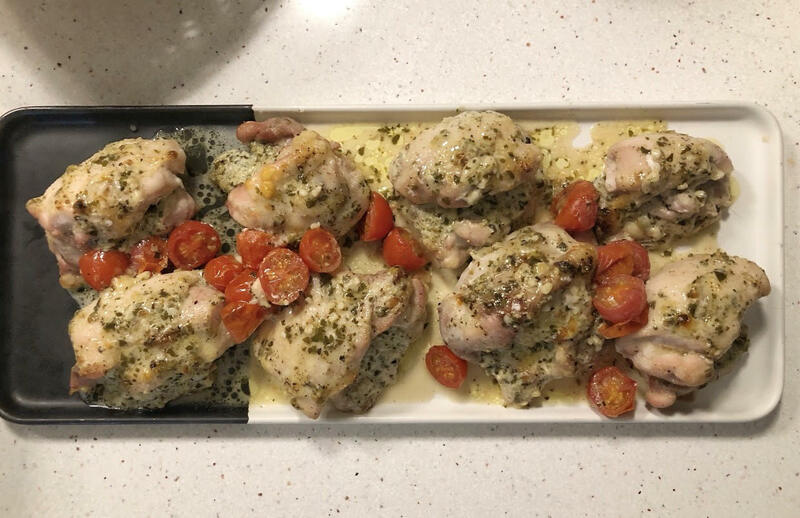 Lay out the chicken thighs on a large baking tray and season with olive oil, and just a touch of salt & pepper. Add a teaspoon of the pesto cheese mixture to the center of the chicken thighs, and fold them over to enclose. Pour any leftover mixture over the thighs. You can then store this in the fridge for a few hours to marinate, or pop directly in the oven. Bake the chicken thighs for 15 minutes. Remove from the oven and add some parmesan cheese, and the cherry tomatoes. Pop back into the oven for another 10-15 minutes, or until the thighs are done cooking. I like to broil them for a few minutes at the very end for a nice browned look! That’s it! SO incredibly easy with virtually zero prep time, but so many complex flavors, thanks to the Boursin cheese. I’ve already made this twice (once for guests), and they’re a huge hit!